Everybody knows that the Pilgrims celebrated the first Thanksgiving, right? Well, probably not, but it was the Pilgrims' Thanksgiving that gave us our Thanksgiving holiday as we know it today. The Pilgrims came to the New World looking for a way to worship God as they wished. They were not Puritans. Puritans wanted to change the Church of England to do away with its bishops but keep its ties to the government. The Puritans went on to settle the Massachusetts Bay Colony. The Pilgrims at the Plymouth Colony were Separatists. They believed the church and the government should be separate, with congregations working independently. This was forbidden by King James of England. He called for the persecution and imprisonment of many Separatists. The Pilgrims decided to try their luck in America. The Pilgrims landed near Cape Cod in middle of winter in 1620. By the spring of 1621, only 52 of the original 102 passengers were still alive, but all of the settlers remained in New World. They settled on lands left vacant by the Patuxet tribe, who had died of disease. Squanto, also called Tisquantum, was a survivor of the Patuxet tribe. He had been captured by English fishermen and sold into slavery in Spain years before. He showed the Pilgrims how to plant corn and where to hunt and fish and acted as a peacemaker between the Pilgrims and the Wampanoag people. The good harvest of 1621 was celebrated by the Pilgrims with feasting, games and prayer. Hunting parties brought back venison, turkey, and fish. The Pilgrims invited the Indians to come and share the feast, and their guests brought even more venison to the celebration. Thanksgiving came to be celebrated throughout New England and later throughout the colonies. President George Washington signed a Thanksgiving Day proclamation on October 3, 1789, calling for a day of thanksgiving and prayer. But it wasn't until 1863 that Thanksgiving was made a holiday for the entire nation. In the middle of the Civil War, Abraham Lincoln issued his Proclamation of Thanksgiving urging all citizens to celebrate Thanksgiving Day. 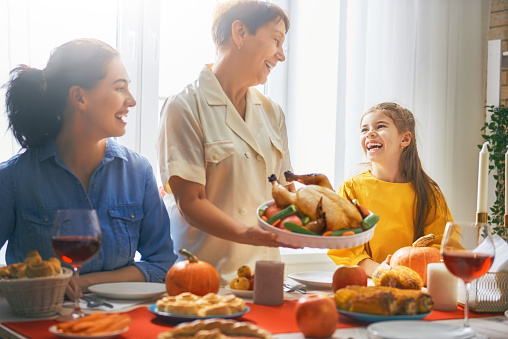 Today Thanksgiving has come to be a time for families to get together to share food and fellowship. This holiday is also an excellent time to tell stories and remember the things that came before. Have a joyous Thanksgiving! For more on Thanksgiving, both past and present, check out our Thanksgiving Stories and Crafts book list!